After a Belgian mine manager, Mr. Legrand, who collected the first specimens. Crystal System Monoclinic. Crystals prismatic, also in sprays and fans. Cleavage Poor. Fracture uneven. Brittle. The maximum to expect in a cut legrandite is about 2 - 4 carats. A larger stone would be a great rarity, and even 1 carat gems are very hard to find. Many mineral specimens exist, but transparent crystals are extremely rare. Occurrence In vugs in limonite. Only occurrence is on Mexico. 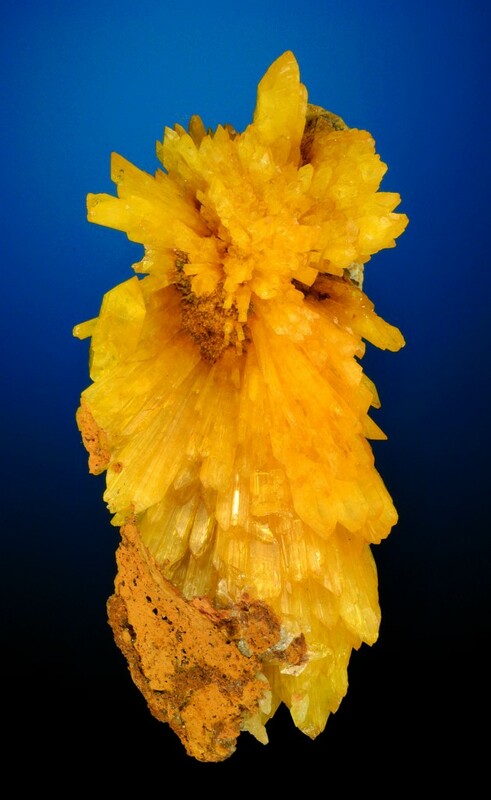 Note: This mineral was first described in 1932, and it has become a very popular specimen mineral with collectors because of its intense yellow color and esthetic crystal groupings. It is too soft to wear, but the yellow color is unique among gems and very distinctive. This is one of the loveliest of all the rare collector gemstones.